Kuntillet ‘Ajrud (Israël): Israelite Kings Depicted in Ancient Art? While many scholars assume the prostrate figure on Shalmaneser III’s Black Obelisk (left) shows the Israelite king Jehu, this is likely a generic representation. Irit Ziffer turns to the site of Kuntillet ‘Ajrud (right) for an Israelite king’s representation in ancient art. Has archaeology uncovered portraits of two Israelite kings? One contender is on the famous Black Obelisk from Nimrud/Calah, but scholars differ about the identification. Another more recent candidate for an Israelite king’s portrait is an image from a wall at Kuntillet ‘Ajrud, a remote site in the Sinai desert. As author Irit Ziffer explains in the September/October 2013 issue of Biblical Archaeology Review, the answer may depend on an understanding of conventions in ancient art. The British Museum’s famous Black Obelisk is often thought to include a portrait of the Israelite King Jehu bowing before the Assyrian monarch Shalmaneser III. However, Irit Ziffer writes that “there are severe problems with the suggestion that we have here a portrait of Jehu. As noted, Jehu’s tribute is described in the second panel from the top. The top panel relates to the ‘tribute of Sua of Gilzanu.’ Gilzanu is in the vicinity of Lake Urmia in the far eastern part of the Assyrian empire. Israel is in the far west, on the Mediterranean Sea.” After exploring ancient art styles and propaganda, she suggests that the Black Obelisk does not include a specific Israelite king’s image, but instead, the prostrate figures are generic tribute-bearers. Pirhiya Beck was able to recreate the bright paint on these fragments from Kuntillet 'Ajrud. Courtesy Ze'ev Meshel/Israel Exploration Society. The ancient art at Kuntillet ‘Ajrud is very different from the Mesopotamian imperial style seen on the Black Obelisk. 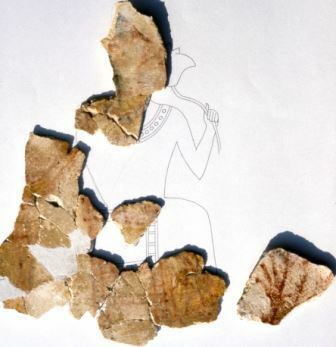 A fragmentary painting at the site’s Building A, a fort-like structure where archaeologists uncovered dedications to Yahweh and Ashera, may be an Israelite king’s portrait. After re-creating the colors on this ancient art, the late scholar Pirhiya Beck suggested that the seated figure portrayed is the king of Judah or Israel. The Kuntillet ‘Ajrud painting falls within an established tradition of seated regal figures holding a lotus blossom that continued for centuries. Ziffer explores similar examples at Late Bronze Age (14–12th century B.C.E.) Tell el-Farah, Iron Age (eighth-century B.C.E.) Calah/Nimrud and even Persian (fifth century B.C.E.) Persepolis.